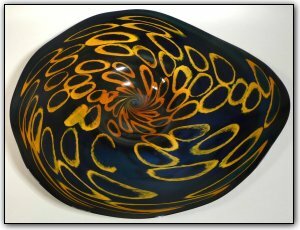 This wallbowl features the bold color combination of black and gold topaz. Working with murrini is a three stage time consuming process, first Dirwood hand pulled the canes used to make the murrini after which he cut the canes into the individual murrini pieces, then he used the murrini to make patterns on the glass as he made this wall bowl. In most lights this piece will appear a black and gold topaz, but under extreme bright light the black will show a very faint blue as seen in the pictures.